Browse family names using the A to Z index below. Sr Marie Therese Rétout was born on April 23, 1922, in Burgundy, France. She was barely 17 when World War II broke out and lived through (in her own words) “the terrifying experience of life in Nazi-occupied France”. Three years after the war ended she entered the Dominican Order of nuns, made her profession in August ‘49 and very shortly afterwards, to the astonishment of her superiors who knew she didn’t want to leave France, she answered the call to serve in missions overseas. She was assigned to mission in Trinidad. However, as she knew no English at all she was sent to England to learn the language while studying the management of children’s homes; she put her studies into practice in a surprising move to Montreal, Canada where she helped to reorganise children’s homes. Six months later (and exactly 57 years ago last month), thankfully she left the frozen North to fly to Trinidad but as she stepped out of the plane in Piarco she wondered if she’d ever survive the heat in the humid tropics. To help her acclimatise she was sent to a house in Toco— with no electricity— but the beauty of the landscape and the sea captivated her— she was here to stay. She began work in the St Dominic’s Home (the Belmont Orphanage) where, for the next ten years, she was, successively, Councillor, Bursar, Archivist and Prioress. She acted as Novice Mistress at the Dominican Sisters’ Noviate in Holy Name Convent Port-of-Spain for a year before returning to St Dominic’s Home from ‘63 to ‘74. In all she spent 20 years caring for orphaned children in Trinidad— and for three of those years she made weekly visits to prisoners on Death Row in the Gaol on Frederick Street. While still working in St Dominic’s home, in 1972 came the beginnings of a career change when she began writing a weekly column for the Catholic News— which is all the more remarkable because she was writing in a language which was not her native tongue. With Fr Peter Nicholson, she was Associate Editor of the Catholic News from 1974 to 1991, at the same time she started writing a series, “Parish Beat”, for the newspaper; by 1976 she had written about no less than 61 parishes in Trinidad and Tobago. This series was so popular, and of such historical value, that Parish Beat was published in book form in 1977. The book was out of print for a short time and a second, revised edition was published in 2004. 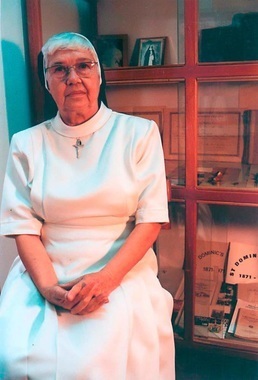 In her mid-fifties she had another career change when she was assigned to as sister in charge of the Roman Catholic chaplaincy in UWI, St. Augustine— but that didn’t stop Sr Marie Thérèse’s writings for 1984 saw the publication of her second book A Light Rising in the West, a short history of the St Augustine Campus and its faculties. This was another winner: a second edition had to be published in 1985. Called to Serve is the title of her third book a history of the Dominican Sisters in Trinidad from 1868 to 1988, published in 1988 with a second edition in 2001. In 1992, now 72, and at an age when most are retired, her fourth book 100 Years of the Catholic News (1892-1992) was published—and she wasn’t finished yet. Her fifth (and latest) book The Land of My Dreams, Just Next Door told of her visit to Venezuela. This book is, perhaps, even more remarkable that at that age, having learned Spanish in the Andres Bello Institute— she wrote that book in Spanish. It was first published in Spanish—in Caracas in 2003, the English language version was published in Port-of-Spain in 2005. In between writing books and newspaper columns Sr Marie Thérèse wrote brochures on the history of the Cathedral of the Immaculate Conception, the religious history of San Rafael, and the 125 years’ history of the Belmont Orphanage. In the years she has lived here she has travelled extensively visiting Switzerland, Yugoslavia (Medugorje) the US, Israel, Rome, Venezuela and “all the islands of the Eastern Caribbean”. She has been, by turns, secretary and French translator and assistant archivist for the Papal Nunciature in Mary Street. While in her mid eighties, she was still the archivist for the Trinidad Province of the Dominican Sisters, and every month took food hampers to 40 needy families in the Malick/Barataria area. Although battling the aches and pains of old age, she still has a smile, a cheerful word for all.